Leading a useful, pleasant life requires energy. Although those wiggling ads on the Web promise me infinite energy if I buy a book, an apparatus or some seemingly magical supplement, I can recharge my battery without paying the hard-sell pros any of my hard-earned cash. I’ll share some of my energy secrets with you and I hope you will fill in Number 10 with one of your energy recharging practices. Technically, my yoga is usually “charging” rather than “recharging.” While I wait for my water to boil in the morning, I do a few sun salutations, usually at least three sun salutation A and three sun salutation B. If the kettle hasn’t boiled yet, I add any postures that I feel like adding or dance around in the kitchen. The practice of resting my mind by disengaging from my thoughts and feelings is vital to me. I like to start and/or end a day with about 20 minutes of mindful attention to my breath. If I find my thoughts are leading me to tense my shoulders (or anywhere else!) during the day, I pause wherever I am and draw my attention away from thoughts and toward the breath until I feel the muscles in my jaw and the middle of my forehead soften. A few years ago I consulted with an Ayurvedic nutritionist who introduced me to therapeutic uses of drinking hot water. For her clients who drink coffee, she recommends starting the day with a cup of warm water (boiled, not microwaved). I start every day this way. 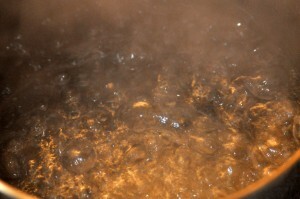 If I feel dizzy, inordinately hungry or more stressed than the day’s activities merit, I have another cup of warm water. Sometimes two. Although I might have things on my mind from the work day, I put them aside when I care for my kitties. The outside kitties greet me in the drive, and the insiders are waiting at the door. All of them are eager to see their beloved human, and I leave my peevish thoughts from work in the car. We have several feeding and grooming rituals that nurture me at least as much as they nurture the cats. My online community changed my life. Someone is always awake in my virtual world. Someone is always ready to help figure out what an overwhelmingly horrible smell might be and to laugh when it turns out to be skunk, not a meth lab. Someone is always ready to play or lend an ear to hear about a distressing day. My online friends’ generosity inspires me to live out as many of my generous and kind impulses as I can. Especially Henry, the most generous bear on Earth. I watch crime shows when I want to get out of my own soup. Comedies just don’t do it for me. The only shows I find really funny also remind me of the big social, political and economic problems that worry me. Fail. When I watch Luther or Criminal Minds, for example, I am riveted to the story. I suppose I could pick up more to worry about from the shows that focus on the cruelest, most out of control people, but generally I don’t even have nightmares after watching. I must say that I can’t watch two in a row and sometimes I’m so exhausted after watching that I need to watch a bit of fluff before turning off the TV. Sometimes, I want a really big change of scenery, like going to the Himalayas in 2009 or Southeast Asia in 2007. Most of the time, however, I’m not that extravagant. The drive to the coast from here is about 3 hours, and I’ve gone twice in 10 years. Mostly, I like to go into the city and sit in a coffee shop where I can see people reading and hear them talking about books and movies. Or I like to go to art museums or galleries. I don’t mean something extravagant. I just mean that when I notice I’m feeling overloaded or run down, I deliberately look for the kindest approach to the situations I find myself in. I hold the door for someone. I buy lunch for my companion. If I’m not around other people, I practice a little loving kindness meditation. I always start with myself and then hold others in mind when I think or recite, “May you be peaceful. May you be safe. May you be happy. May you be healthy.” If I can’t find it in my heart to offer loving kindness to other human beings, I offer it to my cats. Invariably, I feel better for having found a space for kindness in my own heart. What do YOU do to charge up or recharge? These are great tips! I usually recharge my energy by doing Zumba, taking a walk or getting that much needed me time at the end of the day to sit and do absolutely nothing. I have been trying to incorporate mindfulness into my life lately and it has helped tremendously. Negative thoughts can so quickly get out of control and become harmful overall. I usually read or go walking, but I’m going to try your ideas of warm water and a quick bit of yoga in the morning too! Mornings are my worst — it’s so hard to get up and get feeling good right away. the doing something kind is a great way to add a boost to your day! it is like walking on clouds all day and you feel like you could do anything lol!! To recharge I generally pray, read a book, or watch my latest episode of Dog the Bounty Hunter. What can I say? Great tips! I’ve just started with yoga and have convinced my daughter to do so as well. It helps me focus. I love this post. With age, it is increasingly important to me to take care of myself, particularly to model this to my children. I’m saving this list, and planning to make my way back to your blog. I particularly like the offerings of kindness. We could all do with more Grace. I try to give back gently, quietly, in little ways…knowing that what I receive is far more than that which I give away. Thank you for providing an oasis in the midst of my day. Peace and good to you, and namaste. I have to try something like tai chi or a yoga practice where I am not n my knees. You are giving me the push. I make cards, altered books, journals for friends, quilt, knit, read, but I need so physical release. I love your altered books and journals and quilts and…… Thanks so much for making so many beautiful things! I recharge when my grandkids come stay for a weekend. You would think it would tire me but it really gives me a lift. Thanks for the tips I am going to try the warm water before my coffee in the mornings. To recharge myself I like to learn something new. I can relax and read and watch you tube and it makes me feel productive but peaceful at the same time. I also love to cuddle with my kids to recharge and relax. My husband loves to drink hot water and has since he was a kid. He grandpa is the one who got him started doing this. A good book, music and some chocolates for me !!! My favorite to recharge is to pet my cat. The big ball of fur when she starts to purr just makes my day light up. My favorite way to recharge is a nice hot Epsom salts bath, and my favorite book on my Kindle. I usually go for a walk — a nice, long walk, I don’t really mind where. I just want open road ahead. Don’t try to stop me or catch me along the way — it won’t be very easy. Useful and pleasant, your gentleness and kindness are inspirational. Sometimes I feel as though my life is all “indulgence” but a while back I realized that I loved my job, and that *I* am the instrument or means through which my job gets done, ergo, I should treat myself like the precious asset that I am. That freed me up a lot to indulge in such things as books on CD for my commutes, massages to get the kinks out from working all day at my computer (and all those commutes) and I try to work in a mid day break for lunch to separate the morning work from the afternoon work, and then I break again to drink wine, watch the news with my husband before evening work. I also like to express my creativity by making PowerPoint presentations. I know, it sounds weird. I work on counted cross-stitch. Drawing floss through fabric is very meditative for me. I pray and pray and pray some more. I do like the hot water suggestion. I’ve tried this before and it is relaxing! I just discovered yoga and was amazed at how much I enjoyed it – it really quieted my spirit and allowed me to think! I play with my kids. They keep me up and moving and energized. I like to take time and relax. Do nothing important. Just read, take a bath, cook something bad for me. I do nothing, and than dream of what I’m going to do next. To recharge, I stretch and take deep, deep breaths. This usually revives me. I blog:) LOL… sometimes it’s a stresser and other times it totally relieves me. I like to start my day reading a chapter from the Bible. I also lay in bed still just looking at the ceiling to make myself release any and every thought. I find I have a much better day when I don’t immediately go to a to do list. I also love Criminal Minds. It’s my fav show on tv right now. I always try to figure out who, what, when, why, etc. To me that’s fun and relaxing. Robin what a fantastic post. I notice that you’ve been in India – that’s where I live! I find a crazy chat with online friends, making something useful, clearing clutter are all ways for me to re-energize. Thank you for sharing. Where in India do you live? I had dreamed of visiting India for so long that the trip really was a major turning point for me. I hope I get to come back again one day! With a newborn and a 3 year old it is hard to recharge! I do enjoy a nice hot bath with a bit of oil in it. I would like to try daily meditation, I think it would do me a world of good! I grab either a nice long relaxing bath or I grab a book and climb into bed to read after putting up a do not disturb sign on the door. When I need an energy boost, I head to comedy. I’ll flip on SNL or watch stand up on YouTube. It’s refreshing! I love to cook and bake– these usually take my stress level down several notches (unless I am attempting to get dinner on the table with 4 people breathing down my back). I am a very shy person. Several years ago I challenged myself to step out of my comfort zone each time I went to the store. I would smile and say hello to others, hold the door open for them, let someone with less go ahead of me in line. Often these individuals would stop and talk to me for a minute or two. I felt so uplifted from these experiences…. Your story gave me a big smile! I’m happy that your experiment paid off. I want to press a “like” button for Kerry’s post. And, I would press one for Robin in general. I exercise, I read, pray, meditate, I enjoy nature. Creating something definitely gives me energy – love the feeling of accomplishment! Taking time to refocus, and pray over my priorities is also important for me. Reading or watching a nice movie takes all the stress away. I also like to fantasize. It helps sometimes. I recharge by taking a nap. It doesn’t have to be a long one. 15 minutes is enough to help me reduce stress and make it through a rough day. If I can’t nap, I try to get a few minutes of “me” time. A delicious bath. With bubbles, soft candles, scented oil and music. Babies, husbands, iphones not included. I used to love warm baths too. This house doesn’t have a bathtub. Sigh. I’m a big fan of yoga. Currently practicing Mommy and Me yoga with my 5 month old. I’ve heard about drinking warm water but have never tried it. Always seemed odd to me since I love ice cold water. I’m have to give it a go. Nice list! I recently started yoga so I am hoping it will help me recharge, but a good walk with the dogs helps right now. I just pay attention to what’s going on around us and what the dogs are doing that it gives me a chance to clear my mind. I like to visit with our horses. Walk outside. Garden. Make something, I just got a sewing machine for Christmas, so I’ve been experimenting with it lately! DATE NIGHT, so valuable to a stay a home mom! I exercise or read. Sometimes writing works, but not usually. I don’t play many games on Facebook, but for some reason, I find that if I just need a few minutes to step back and relax, I can play a game or two of Bejeweled Blitz (1 min each) or Mahjong Trails (5 minutes) and I’m usually good to go again. It may be a combination of the mini-break and the puzzles. I get a good nights sleep of at least 8 hours when I really need to recharge. I am normally a night owl so I don’t really go to bed until close to midnight. Since I’m a teacher I have to get up early so I don’t normally get more than six hours of sleep per night. When I really need to recharge I got to be a little earlier and I feel so much better the next day! That is a nice list you have. Time alone with God, first. I like to get up really early before my family gets up. Best time of the day for me. I love the quiet and peacefulness of early mornings and my cup of coffee. Those are great tips! I’m not really a get up and go person. Even my 15 month old doesn’t want anything to do with me in the morning. To recharge, I usually take a hot shower. Something about a clean body makes me feel like I’m making a fresh start. I agree with “care for someone you love.” Snuggling with my kiddos always eases my mind and nourishes my soul! I like to curl up with a book and a cup of coffee. I’ve always had a love of reading, ever since I was a little girl. Speaking of coffee, I’ll have to try out your hot water tip and see how it makes me feel after a couple weeks. Sounds interesting! I still drink a lot of coffee. My nutritionist would be appalled. I listen to instrumental music and tried not to think of anything and anybody. It’s relaxing! We all could use a recharge! I just like to close my eyes and take deep breaths. I talk to my husband. I just enjoy talking to him and laughing with him. Great list! Never knew that about hot water! Great list! I especially will take the advice to take care of someone else. It’s true that we find the greatest fulfillment when we help others. I am with you on yoga and animals, and pretty much everything else on your list. Going for a run helps me tons, creating things, and above all, helping someone else. It is amazing the sense of well being that comes from being of service. Thanks for the thoughts! Wonderful tips! I really need to get back into yoga, I always felt much better when I did it. I am a big fan of Criminal Minds too, it definitely pulls you in and gives you an escape for an hour. I never heard of drinking warm water though, I’ll have to try that! As lazy as it might sound, I nap. As a mom of four under the age of eight, it makes sense to me since I never get a full night of uninterrupted sleep. I also like to put my focus on others. We like to give away homeless blessing bags (plastic storage bags full of socks and treats). It always encourages me to offer one of these to someone on the corner. I try to fix something that’s disproportionally aggravating, like cleaning out my inbox or organizing a messy drawer. Sometimes it’s as simple as moving a piece of awkwardly placed furniture. I think it’s a sort of feng shui approach–a harmonious environment contributes to a harmonious mind. Great idea! Unblock some energy. I’m going to try it. Exercising recharges me. In fact, I have to be careful because if I do 20 minutes on the recumbent bike in our livingroom at any time past 8pm then I have a hard time falling asleep. Great list, by the way. I’m bookmarking your site. I took an Ashtanga yoga workshop and had just that problem! After the evening session I was awake at least until 2 a.m. although I had to get up for a 9 a.m. start of the second part of the workshop. Regular Ashtanga practice is only carried out in the morning for good reason! As a mom of six, I am the most energetic when I incorporate a 20 minute power nap. Fun post! Hmm. I want to try the hot water thing! I like to recharge by writing, whether on my blog or in my journal. Really makes me happy. Usually after my girls go to bed I do the things I enjoy like reading. That totally helps me recharge and get ready for another day as mom! I like the list, and I never knew drinking hot water was so good. And speaking of hot baths, I could use one right now. Thanks for the informative, fun read! Thank you so much for writing this post. As a mother working part-time from home with Fibromyalgia, I can tell you that finding ways to recharge is vital if I want to keep on ‘keepin’ on’! I love the peacefulness of yoga. A hot bath with bubbles and Epsom salts is a great recharger, as well as spending a couple of hours in the local coffee shop, reading a great book or knitting. Thanks for giving me some new ways to recharge! A good long walk usually energizes me. Great tips! Thanks for sharing! I count my blessings, and think about fun future events that are soon to come. I just read about a couple of those natural ways to keep yourself healthy. A top thing I do is pray. Being able to trust and rely on God to help me sort out the tough stuff in life helps me in so many ways. I like to listen to energizing music! I have heard about drinking warm water. I believe I heard we should always be drinking liquids that are our bodies temperature ~ it is easier on our digestive system. Exercise helps me and just keeping structured. Time out and breaks help tons! As a mom of three little ones sometimes that recharge comes through a nap or a hot shower (where hopefully they won’t barge in). But I also love to recharge by reading a good book and finding myself in another place. These are all really great tips! I like to take a few quiet minutes to recharge … it really helps when I am having a stressful day. Great tips! I usually take a walk, play with my kids, or try something new. To recharge I find that exercising works for me. Initially I’m exhausted, but once I recover I’m re-energized – and the more I exercise generally, the more energy I have generally! 1. Reading God’s Word is definitely a pick me up. 2. Although moving may be the last thing I feel like doing, but gives me energy to get through my evening. I usually try to get in a quiet place and meditate. It works well for me when I have many thoughts. Great tips. Thanks for sharing these. Have a beautiful day. Wonderful tips! I especially agree with the change of scenery tip. When I feel at my wit’s end, I opt for a short trip with my family. It can be a weekend trip only a couple of hours away from home but I come back relaxed and reenergized. I take a nap. Sometimes some quiet time in a dark room is rejuvenating to me. I like to read or think about the great blessings I have. Faith is a big comfort for me. I play with my kids, read a book, pray, exercise. Great tips on how to recharge! I like a nice hot shower or a back massage to recharge! Or just connecting with my hubby on date night. Listening to my favorites songs gives me a great boost of energy. I have to get back to meditating because that gives me a positive boost as well. Wow, I found the warm water very interesting. I don’t think I could, but it is a great tip. Since I am 27 weeks pregnant I like to take naps with my 4 year old. Exercise also helps energize and recharge me. I think all these suggestions were great! I myself, love mysteries and crime shows. I am also trying to walk daily. I think everyone should have an interest that brings them pleasure. I need to get more energy, I drink a lot of green tea and I think it helps maybe like the warm water. And, spiritually, reading the Bible and singing/listening to some uplifting music is always helpful! I like the idea of drinking warm water. Is there a reason it has to be boiled and not microwaved though? The nutritionist has strong opinions about not microwaving. I don’t remember exactly, but it has something to do with the life-force in the food. She recommends not microwaving anything. I’m usually doing things for other people so it’s always recharging for me to remember to take time for myself and do something for me. This may just be reading a book, playing a game, cooking a recipe I’ve wanted to try, or just going for a walk. These are GREAT suggestions. I have also found that good hydration goes a long way to keep me going. So when I’m tired, I’ll often down a liter of water! I like to run on the treadmill while reading. If that is not possible, having time to myself in the morning to read my Bible and pray really seem to help. I have found using a sticky note over my sink with an encouraging verse helps me to remember throughout the day that there is more than just me and the current circumstance. I used to read while riding the stationary bike at the gym on campus, then they changed to machines I don’t really like. I have fond memories of reading a funny novel and laughing out loud with the students wondering what the heck was up with me! My mom and grandmother always drink hot water, but I didn’t realize it would restore energy. I like to recharge by doing something fun with my kids – visiting a museum or wildlife park! Great suggestions! I have been using deep breathing to counteract stress. It really does help! I also like changing the scenery (going for a walk alone does wonders!). Prayer time is also really helpful for me. I find going out in the evenings (which I don’t do all that much) charges me. I feel more alive when I’ve been out. What a great list of tips. I, unfortunately, can’t contribute to it seeing as how I’m tired (exhausted, really) all the time. But I think I’ll try a few of these and see if they work for me! Thanks! What a great list! I would like to incorporate more of these into my life! I really like your blog….I’m sure I”ll be back!!! Very practically, sleep. And also to exercise and spend quality time with my family. I read fiction books and short stories. I’ve been an avid reader since I learned to read. It’s my time to escape. Thanks for sharing these great tips. I have just taken a shining and I can not believe how good it makes e feel. I love the feeling of pride and accomplishment that I get from making something, even if its a pan of muffins. I like to step away and do something different – whether it is reading or going for a run. A yoga session also helps. What wonderfully helpful advice. They all sound like great ways to recharge your battery. My personal recharge method is to grab a cup of hot tea and either pray or read (sometimes the Bible. Sometimes fiction). Both pushes all my mental and physical stress away for me. I like to do stretching, although not specifically yoga. I’ve been meaning to incorporate more into my life, so maybe I’ll start doing it when I make my tea! What wonderful ideas! I love to go outside and work in my garden when I’m in need of a recharge. I enjoyed this post, it was inspirational. Thanks for sharing. I wish I could get the Texas soil to produce for me. I’ve given up on everything except a few herbs. We’re putting in native plants as much as we can and letting the place go wild. Well, as wild as one can in the middle of a city. You have some great ideas. I like to do yoga and meditation too. I guess I’d add gardening to your list. Not flowers, vegetables. I have to have some sort of pay off like a juicy watermelon, when all is said and done. I sleep, read, or turn on music. Drinking a glass of wine with the reading or listening to music also helps me “recharge,” NOT “charge.” To “charge” I sleep. Sleeping is something that my body sometimes cannot get enough of. Do you watch The Mentalist? It’s my favorite crime show. To unwind, I often read a book with an engaging plot. Poison Study by Maria V. Snyder is one of those books that had me tearing through it and forgetting about the world for a few hours. Yes, The Mentalist is on my list of show to watch! Interesting post…I never knew that about hot water. I will need to incorporate that into my daily routine. Some days are better than others but then you have those days that you are completely drained. Absolutely wonderful tips. I’m intrigued by the drinking warm water. I will have to try it. I start my day with pilates and journal writing. And usually mid-day after lunch I meditate for 20 minutes. I work from home so the mid-day meditation works with my schedule. Visited through Blogelina for the first time. Great blog! I can’t imagine not starting my day with a cup of coffee!! To recharge, I usually sew. I love doing it and I have something to show for my efforts. My sewing stuff is set up in a room with a fireplace so in the winter I love to be in there when the fire is going. Your sewing room sounds great! I wish I had a fireplace, but I don’t. Maybe in the next house. For me it’s a nice, hot shower. Love these tips, I am going to start incorporating some of them into every day routines. I used to work with some Korean ladies and every morning while we were all drinking coffee, they had hot water. We asked why and they said it’s good for digestion. I too get away with the crime shows. I personally love NCIS. I think I’m borderline addicted to it! I recharge by going outside for a walk. It’s very refreshing! Take a warm bath while counting my blessings. Great tips! I also practice yoga each morning – don’t think I could start my day without it. And funny enough, I just posted yesterday about drinking hot water!!! Bible time and exercise are my favorites! I love this post. I often find myself “running low” after a long day of plugging away at the blog. It’s nice to recharge by playing with our animals or just taking our children out to the park for a nice afternoon. Great post! My cats are my lifeline more days that I care to reveal. I love #2, I will try to work on that. I always have a hard time mid afternoon. Maybe I will try the warm water then. I like to read and just relax in a quiet place or go on a walk. I like to go for walk, or a swim if it’s warm enough to recaharge. It probably sounds weird, but I pick one small area to deep clean. After seeing how clean it looks, I feel ready to tackle the mundane chores of everyday, and get the rest of my house deep cleaned. That or I shut myself in a room, have a good cry, and take some deep breaths. Although I don’t clean much myself, I can see the cathartic value of a good clean. And of a good cry too! i usually read a great book, take a bubble bath at night when it’s quiet, go for a walk outside, have a cup of hot cocoa or herbal tea steeped in apple juice (it tastes just like apple cider!) And of course a piece of chocolate never hurts! But i also find serving friends or family is always a great way to recharge! Tea steeped in apple juice sounds yummy! Thanks for the idea. I was introduced to drinking hot water by a Mongolian roommate and did it for a long time, thanks for reminding me about the practice! I have just started doing yoga, and doing a few stretches/breathing practices has helped me sleep through the night (a feat difficult at 32 weeks pregnant with loud neighbors!). My recharging is reading a book, not for information but the sort of “mental junkfood” type. . .something fiction and fun. It helps me deal with the real world after that! Thanks for the list, keep it up! I love this post – I think you are a person after my own heart! I find that writing recharges me. If I need a change of scenery, I’ll take my netbook or laptop to a cafe and do some writing there as I enjoy my drink and do some people-watching. Thanks for these great suggestions! I read God’s word and listen to worship songs to recharge. They ‘re really effective in de-stressing me. I like to take a walk alone, or if I don’t have the time for that I close my eyes and concentrate on my breathing for a few minutes. Works every time. What a lovely post! I find energy in being creative, spending time with those I love, spending some quiet time with the Lord, and through exercising! I do believe that there are so many distractions these days that appear to be “relaxing” but really are just draining – like tv, facebook, and the like. Anyway, great post, I really enjoyed! Recharging is definitely necessary for us all!! I usually recharge by sitting alone and reading a book or magazine, outside if the weather is nice, or cardio on the elliptical, or just relaxing watching tv shows I have DVR’d like Nate Berkus! Love him! Hot tea after a long day is great too! After this baby comes I plan to get back into my workout routine and yoga to help keep my stress levels in check. I had no idea about the warm water, will have to try that right now! THanks for a great list. I also find unplugging is helpful for me to recharge my energy-weird but true. Sometimes my phone, computer, tv, and all other forms of media can make me more stressed out and sometimes I just need to unplug and relax with my family! I like #6, 8 and 9. I like to read a good book. I do crafts to recharge! I’ve been avoiding toxic people and engaging more and more with positive people in my life and I love that i have done that! i also love to spend quality time alone and treat myself once in a while to something nice. p.s. i love your list!!!!!! I read or take naps. Good ideas! To relieve stress I will take a hot bath, uninterrupted (which is extremely rare with 4 kids), blog/write, read my Bible/spend time in prayer, clean something, bake, take a nap, read a novel, exercise, take the dog for a walk.